Niels Bohr is best known for the investigations of atomic structure and also for work on radiation, which won him the 1922 Nobel Prize for physics. In the autumn of 1911 he made a stay at Cambridge, where he profited by following the experimental work going on in the Cavendish Laboratory under Sir J.J. Thomson's guidance, at the same time as he pursued own theoretical studies. In the spring of 1912 he was at work in Professor Rutherford's laboratory in Manchester, where just in those years such an intensive scientific life and activity prevailed as a consequence of that investigator's fundamental inquiries into the radioactive phenomena. Having there carried out a theoretical piece of work on the absorption of alpha rays which was published in the Philosophical Magazine, 1913, he passed on to a study of the structure of atoms on the basis of Rutherford's discovery of the atomic nucleus. By introducing conceptions borrowed from the Quantum Theory as established by Planck, which had gradually come to occupy a prominent position in the science of theoretical physics, he succeeded in working out and presenting a picture of atomic structure that, with later improvements (mainly as a result of Heisenberg's ideas in 1925), still fitly serves as an elucidation of the physical and chemical properties of the elements. 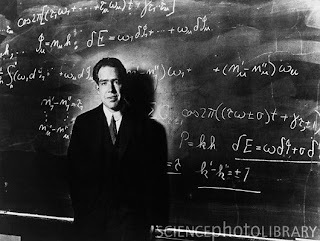 Bohr also contributed to the clarification of the problems encountered in quantum physics, in particular by developing the concept of complementarity. Hereby he could show how deeply the changes in the field of physics have affected fundamental features of our scientific outlook and how the consequences of this change of attitude reach far beyond the scope of atomic physics and touch upon all domains of human knowledge. These views are discussed in a number of essays, written during the years 1933-1962. They are available in English, collected in two volumes with the title Atomic Physics and Human Knowledge and Essays 1958-1962 on Atomic Physics and Human Knowledge, edited by John Wiley and Sons, New York and London, in 1958 and 1963, respectively. Niels Bohr was President of the Royal Danish Academy of Sciences, of the Danish Cancer Committee, and Chairman of the Danish Atomic Energy Commission. He was a Foreign Member of the Royal Society (London), the Royal Institution, and Academies in Amsterdam, Berlin, Bologna, Boston, Göttingen, Helsingfors, Budapest, München, Oslo, Paris, Rome, Stockholm, Uppsala, Vienna, Washington, Harlem, Moscow, Trondhjem, Halle, Dublin, Liege, and Cracow. He was Doctor, honoris causa, of the following universities, colleges, and institutes: (1923-1939) - Cambridge, Liverpool, Manchester, Oxford, Copenhagen, Edinburgh, Kiel, Providence, California, Oslo, Birmingham, London; (1945-1962) - Sorbonne (Paris), Princeton, Mc. Gill (Montreal), Glasgow, Aberdeen, Athens, Lund, New York, Basel, Aarhus, Macalester (St. Paul), Minnesota, Roosevelt (Chicago, Ill.), Zagreb, Technion (Haifa), Bombay, Calcutta, Warsaw, Brussels, Harvard, Cambridge (Mass. ), and Rockefeller (New York).